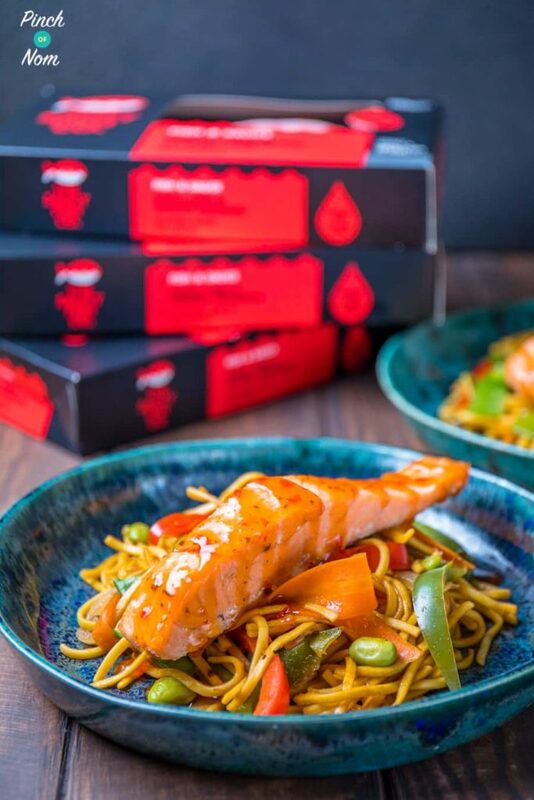 As you may know ‘If it swims it slims’ is a mantra we live by here at Pinch of Nom, and this Low Syn Ginger, Chilli & Lime Salmon with Noodles recipe is a perfect Slimming World friendly meal. We adore The Saucy Fish Co frozen range, we always have some in the freezer. They take the fuss out of fish when you’re in a rush, and they leave hardly any dishes to clean! The less work to do the better. Salmon is one of our favourite fish. In fact, I’d say that it’s our favourite fish. 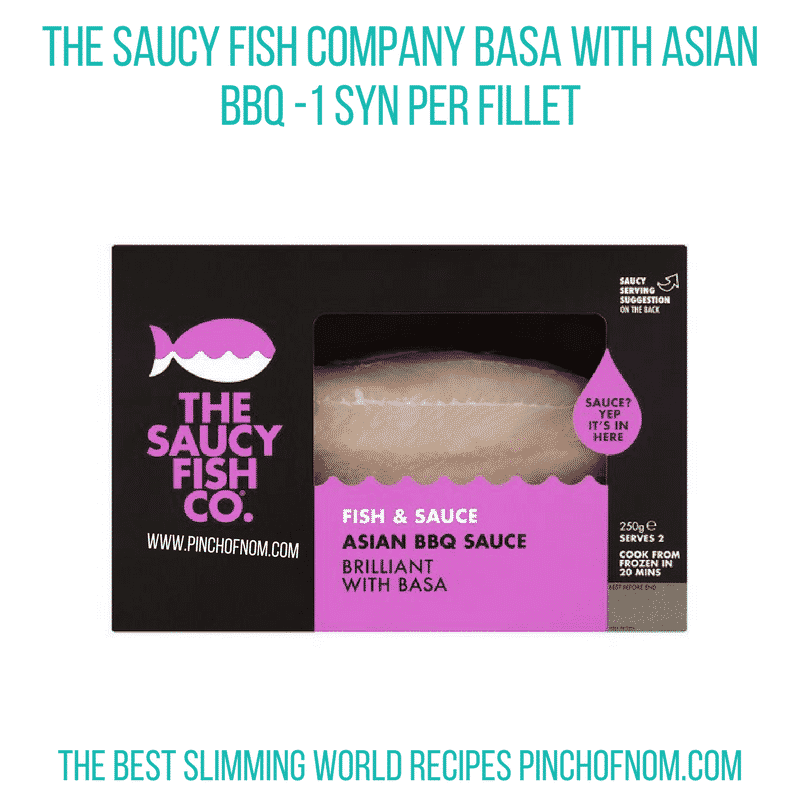 Just so versatile, and it pairs really well with Asian flavours without overwhelming the fish. 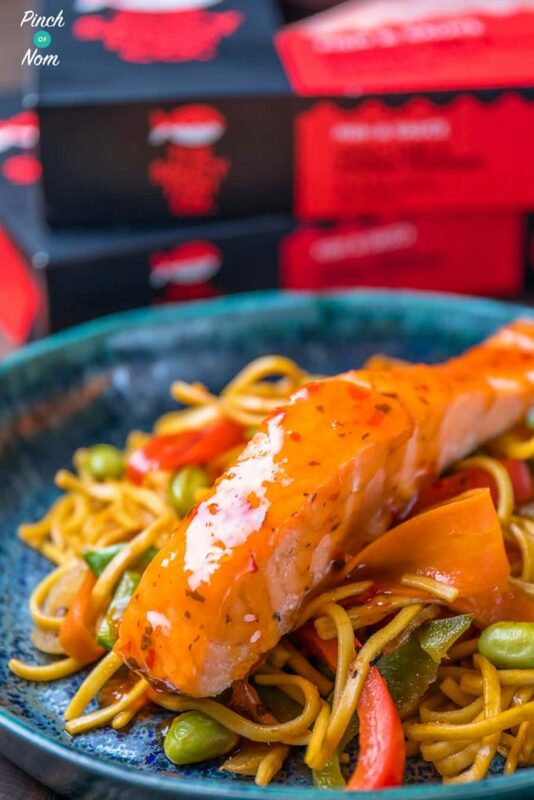 Chinese fakeaways are a favourite in our house too, so pairing this Saucy Fish Co Salmon with a quick noodle stir fry loaded with speed food, makes the perfect Slimming World dinner. You could even swap the egg noodles for some courgetti if you’re doing an SP day. As for the speed food in the noodles, you can use pretty much anything you like. We’ve even got a Slimming World speed food list to help! 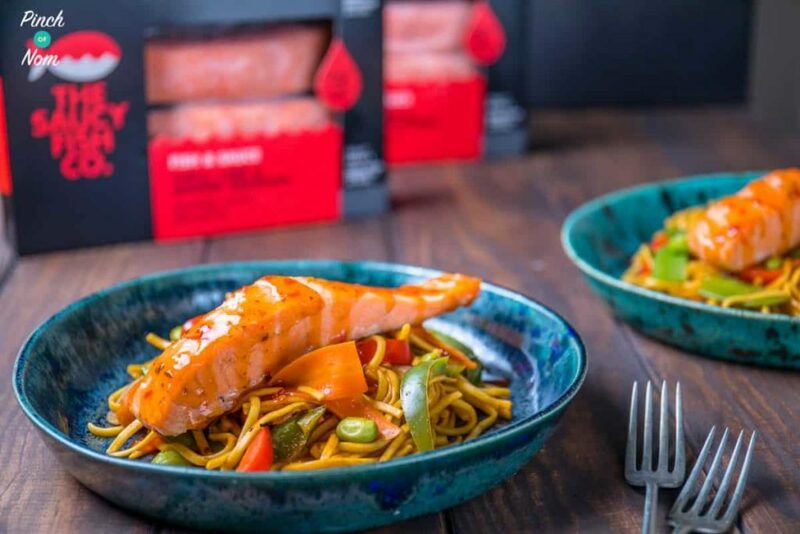 Some of you love this Low Syn Ginger, Chilli & Lime Salmon with Noodles recipe! One of our Instagram followers @darren2slim made this dish and loved it! What do I need to make this Low Syn Ginger, Chilli & Lime Salmon with Noodles recipe? 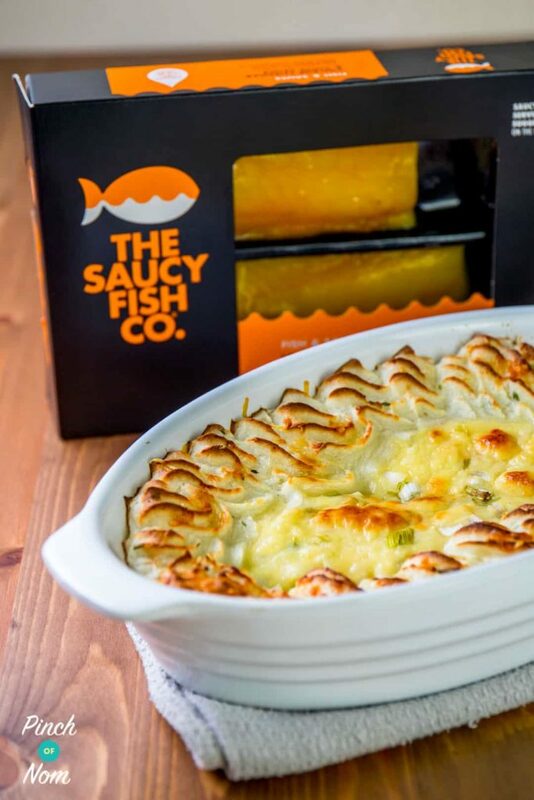 You may remember, a while back, we created a 1 Syn Smoked Haddock and Cheese Gratin using one of the frozen Saucy Dish Co. range. 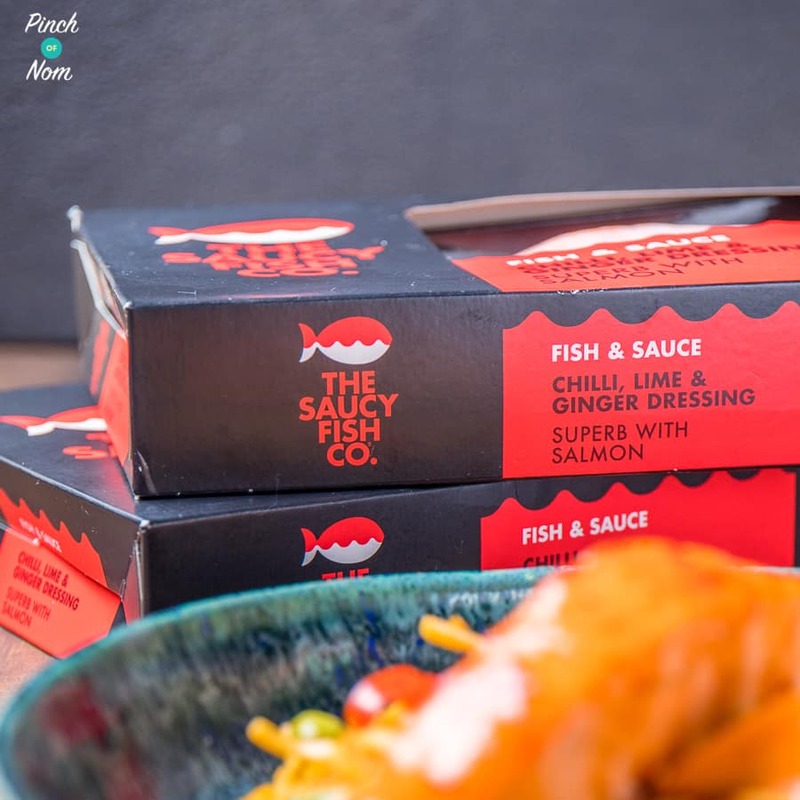 The Saucy Fish Co.’s cook from frozen Salmon with Chilli, Lime and Ginger dressing we used in this recipe and the Basa with Asian BBQ sauce are available at the reduced price of £3 from Tesco stores nationwide, for a limited time only. They are well worth it in my opinion! Where can I learn more about The Saucy Fish Co? 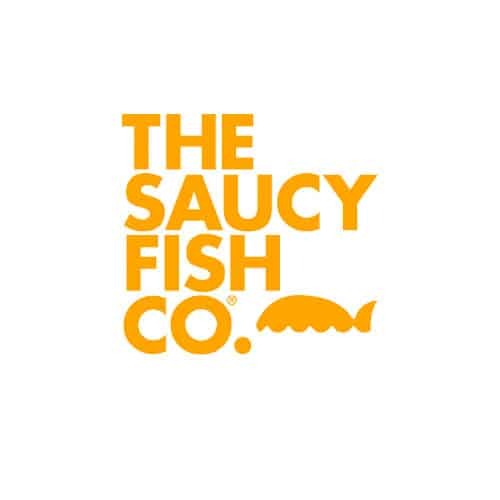 You can find the whole range of The Saucy Fish Co products on their website! Have a swim over & take a look. They’re also on Twitter, Instagram & Facebook! How many Syns are in this Low Syn Ginger, Chilli & Lime Salmon with Noodles recipe? 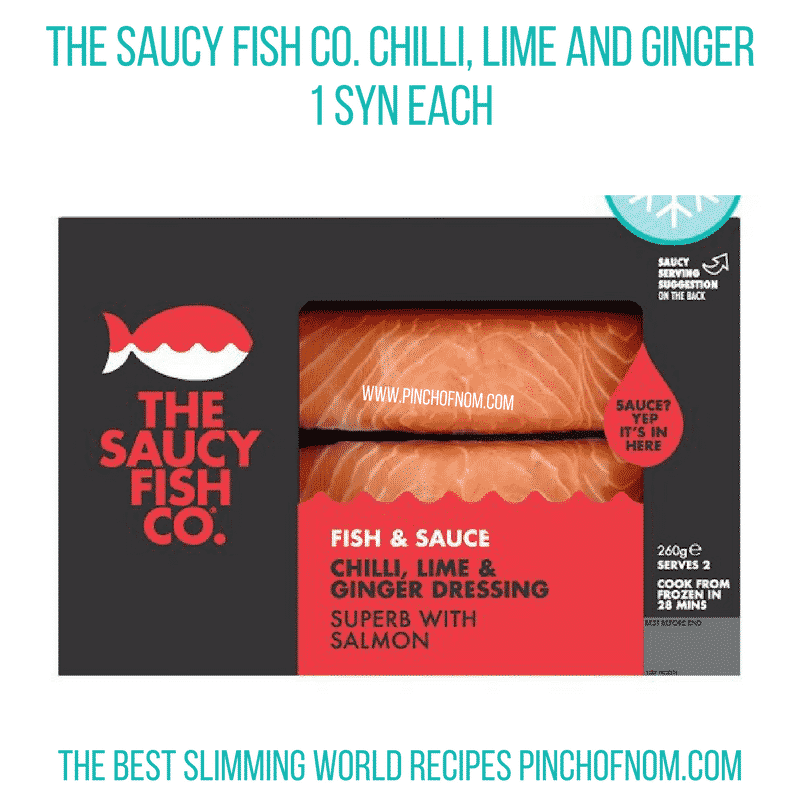 The Saucy Fish Co. range varies in Syns, but the frozen Salmon with Chilli, Lime and Ginger dressing is only 1 Syn per portion! Want to see how easy this Low Syn Ginger, Chilli & Lime Salmon with Noodles recipe is to make? Watch the video! 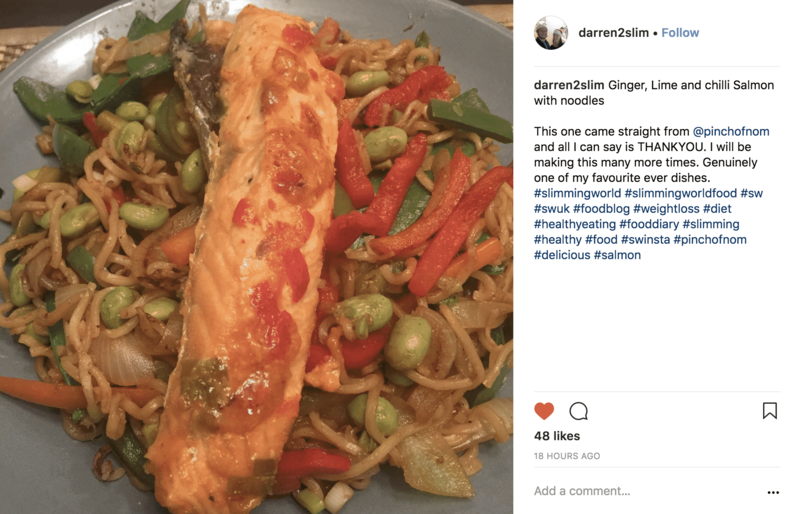 How do I make this Low Syn Ginger, Chilli & Lime Salmon with Noodles recipe? Prepare and cook the salmon as per instruction on the box. Spray a frying pan or wok with Frylight, then cook the garlic, Ginger and onions until they start to brown. Add all the other veg, apart from the spring onions. Add all the liquids and stir well. Add the drained noodles and spring onions, and cook for a couple of minutes. Place the sauce sachet in a pan of boiling water for 4 minutes. Divide the noodles between 2 dishes. Remove the cooked salmon from the bag and place on top of the noodles. Cut open the sauce sachet and drizzle it over the fish. 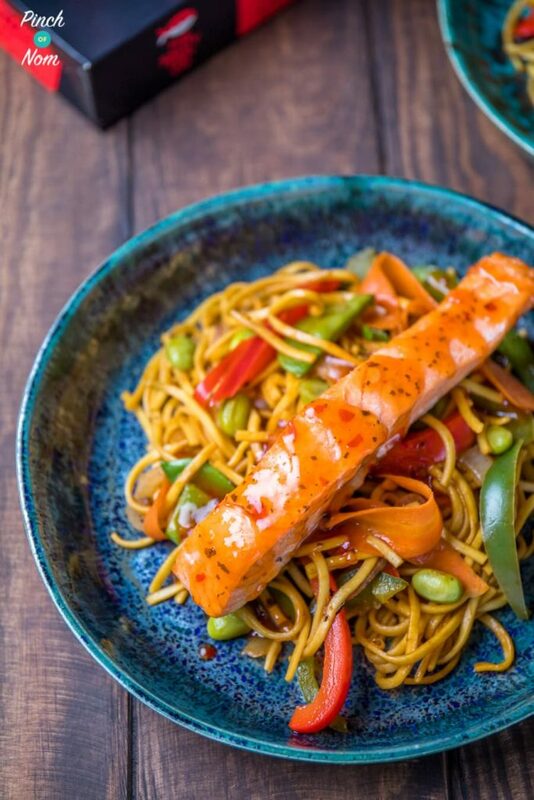 Like this Low Syn Ginger, Chilli & Lime Salmon with Noodles Recipe? Why not try these? I love the sound of this dish and want to try it but I live in Spain and can’t get the fish with the chilli sauce, so I was wondering if you could give me a recipe that I can substitute it with.